Faculty and students in the Frostburg State University engineering program. First row: Associate Professor Dale Schultz, Lucas Calvert, Travis Straube, Garret Vanttorn. Second row: Wesley Goodnow, Alex Conrad, Chris Barrett, Emilio Harmol. Third row: Associate Professor Scott Hemphill, Austin Bender, Matthew Tress, John Lawlor. NORTH EAST, Md. – With the arrival of spring, there are eight students on the Cecil College campus finalizing the last weeks of their undergraduate degrees in engineering from Frostburg State University. 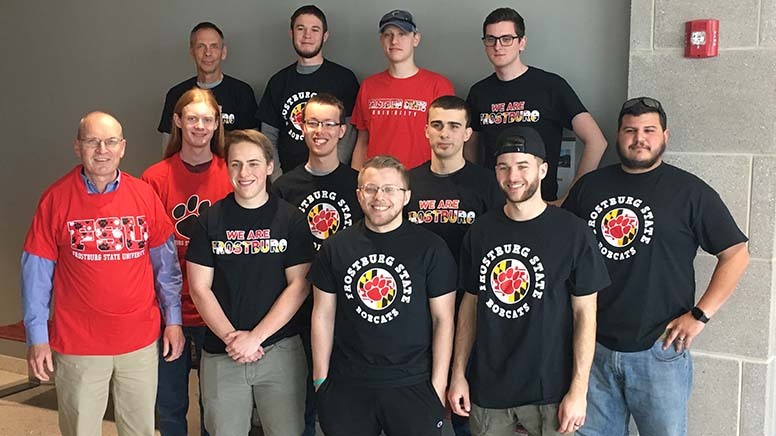 This is the second cohort of students to complete a Bachelor of Science degree in engineering from Frostburg State University without leaving Cecil County. Under an articulation agreement, students from Cecil College and Harford Community College complete an associate degree in Mechanical Engineering in their home counties. Upon completing their associate degrees, these students can transfer into the Frostburg State School of Engineering and then complete their junior and senior years on the North East Campus of Cecil College. Students who complete this program finish with Bachelor of Science in Engineering with a concentration in Materials Engineering. An added bonus Frostburg State University offers is a $1,250 scholarship for each semester a student maintains a GPA of 3.0 or better. There are eight students graduating from the Frostburg State program this spring with another two students on track to complete their degrees in December 2019. To learn more about the engineering at Cecil College degree program, visit www.frostburg.edu/engr-cecil-collegeor call Cecil College at 410-287-1000.